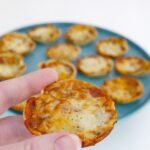 These low carb pizza bites only need 5 ingredients! 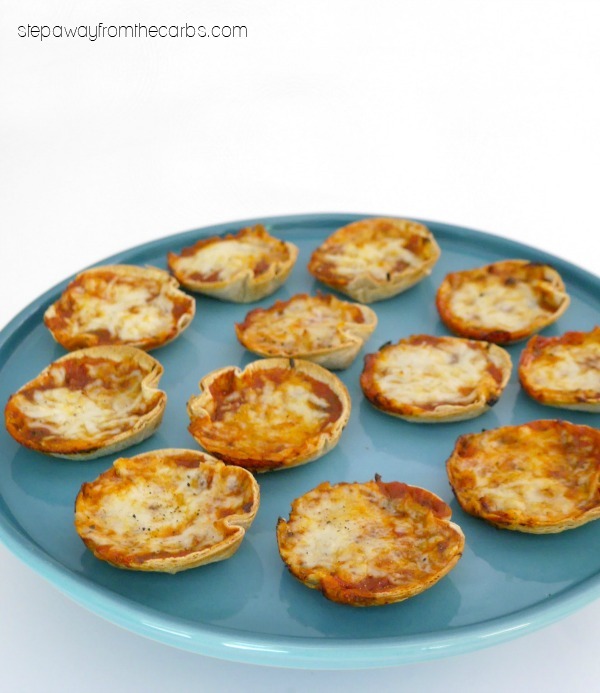 Great for entertaining, appetizers, or snacking! 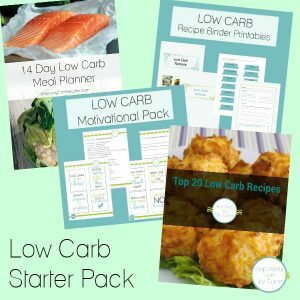 As you probably know, I love using low carb tortillas in as many ways as I can! Once you’ve found a brand that you like (see my tortilla comparison if you haven’t! ), then you can turn them into chips, nachos, taco shells, and more! My current favorite is Mission fajita size – and recently I decided to make them into little low carb pizza bites! They’re filled with tomato, pepperoni, and cheese – although I appreciate that in the final photos you can’t see the pepperoni as I buried it in cheese – but it’s there! 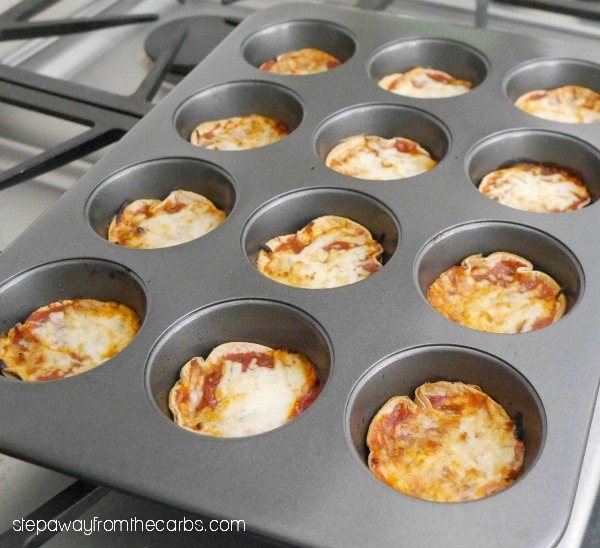 A 12-hole muffin pan is essential for these, otherwise they’re going to get messy. I used 3″ and 3¼” cookie cutters, and managed (just!) to get three rounds out of each 6″ tortilla. By the way – don’t discard the off cuts – just trim them up and make them into homemade tortilla chips! Once the circles have been cut, spray the pan with some non-stick spray and press each tortilla circle into the cups. 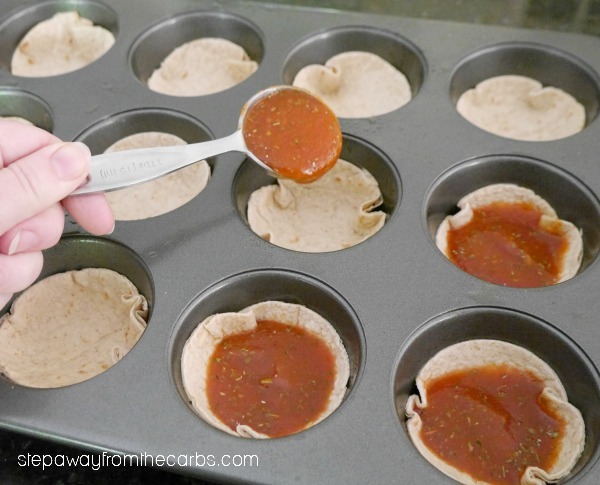 Mix together some canned tomato sauce with Italian seasoning, then spoon a tablespoon of the sauce into each tortilla cup. 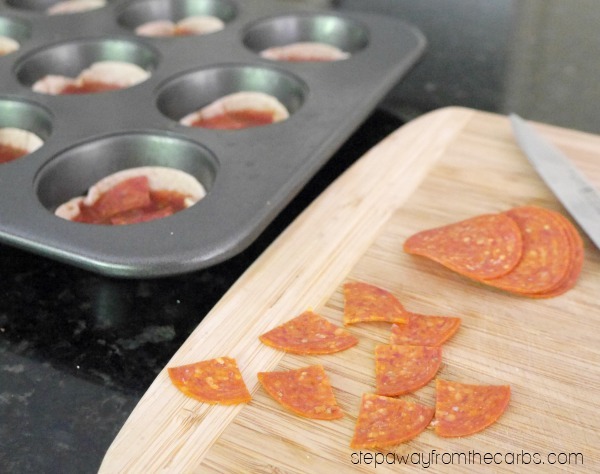 Slice some pepperoni into quarters (or you can omit this for a vegetarian version), then divide between the pizza bites. And finally, top with shredded mozzarella! Bake in a preheated oven for 10 minutes, or until the tortillas are crisp at the edges, and the cheese has melted and started to brown. Leave for 10 minutes before serving – otherwise the sauce will be way too hot! 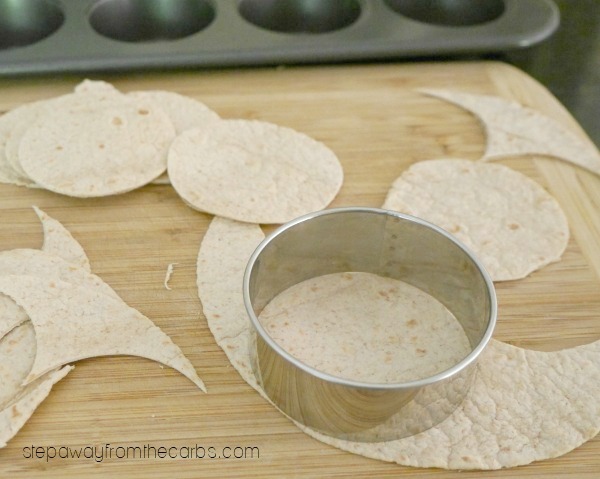 Use 3" and/or 3¼" cookie cutters to cut three rounds out of each tortilla. 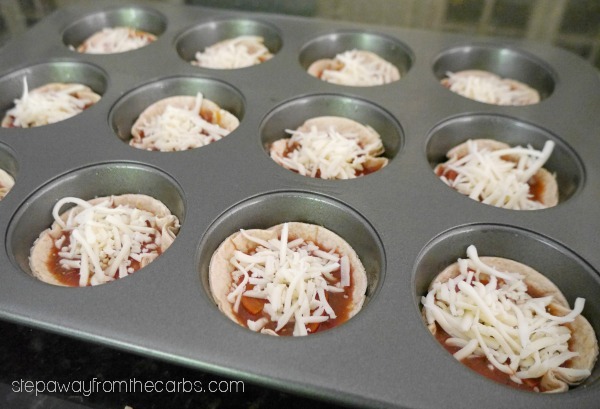 Once the circles have been cut, spray the pan with some non-stick spray and press each tortilla circle into the cups of a 12-hole muffin pan. 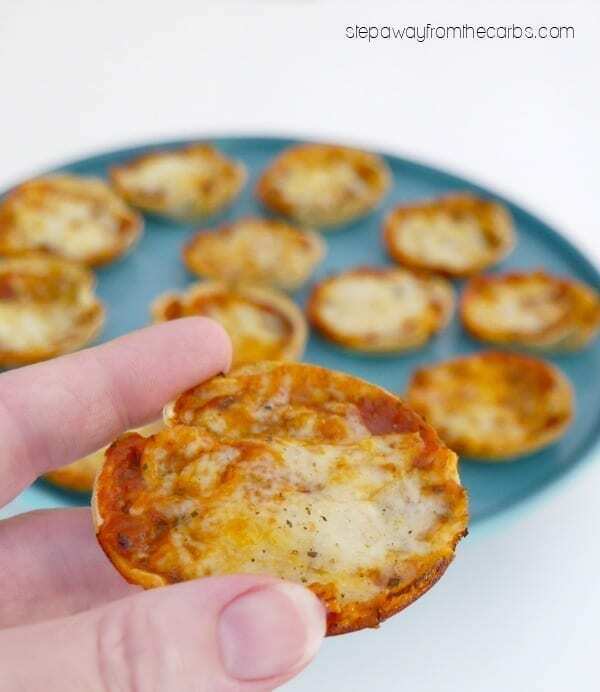 Mix together the canned tomato sauce and Italian seasoning, then spoon a tablespoon of the sauce into each tortilla cup. Add two quarters of the pepperoni to each cup. And finally, top with shredded mozzarella - about 1-2 tsp per cup. Bake in the oven for 10 minutes, or until the tortillas are crisp at the edges, and the cheese has melted and started to brown. Leave for 10 minutes before serving. Note: nutritional value is based on 6" tortillas with a 3g net carb count. 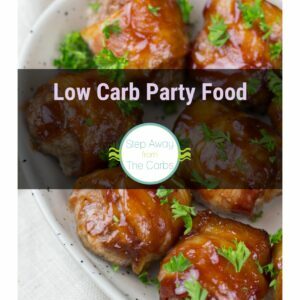 The final count carb will actually be lower as not all the tortillas are used.